Bananarama - don't it make you feel good? 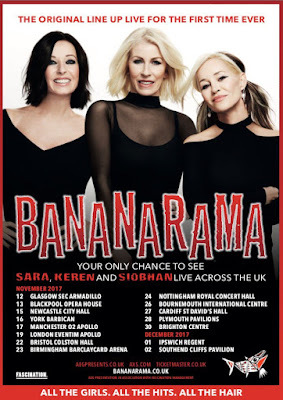 In the 1980s Bananarama produced a string of catchy, finger-clicking songs, which landed them in the Guinness Book of Records as the most successful all-female band in the world ever. They first came to public attention in 1982 as backing singers for Terry Hall, Neville Staple and Lynval Golding's Fun Boy Three hit "It Ain't What You Do It's The Way That You Do It", before the roles were reversed when Fun Boy Three were backing singers on "Really Saying Something" later that year. Despite 32 Top 40 records and chart topping tracks on both side of the Atlantic they always came over as a bunch of pals enjoying themselves. In 1988 the band came under the direction of the pop music sausage factory that was Stock, Aitken and Waterman, and Siobhan Fahey left the band to enjoy success with Shakespeares Sister. 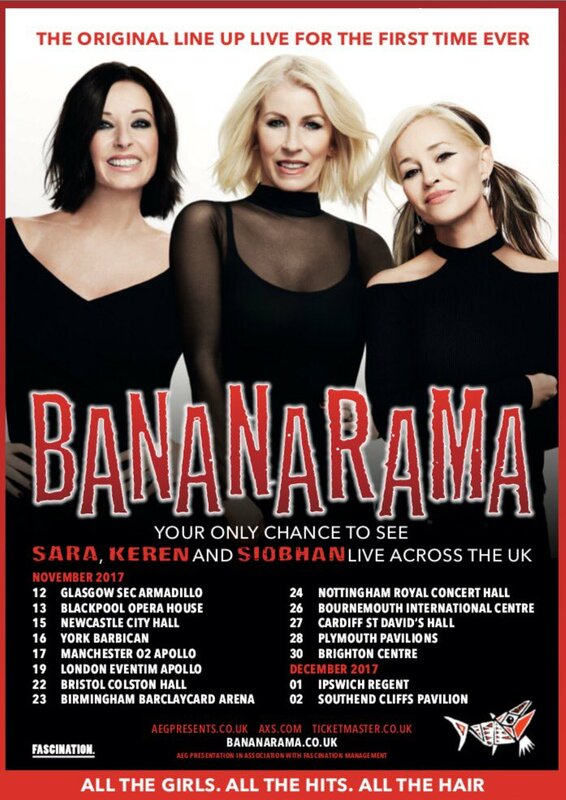 Banararama have continued since then in one form or another with Sara Dallin and Keren Woodward still recording and touring under that name, but 2017 marks the return of the original line up, playing live together for the first time in almost 30 years. Their short tour has now been extended with some dates in America added, and the UK dates sold out in super-fast time. The crowd were a mixture of the curious and the dementedly enthusiastic, but from the opening bars of "Nathan Jones" we were all on our feet. Among the audience was Bobby Bluebell, one time partner of Siobhan Fahey, whose band rose to fame with a cover of the Bananarama song "Young At Heart". Playing with a four-piece live band the rickety synchronised dance moves were all there, even if Siobhan was off doing her own thing a few times. "Robert De Niro's Waiting" and "Cruel Summer" were the early singalong songs in the setlist, with early demo track "Aie a Mwana" ("it charted at number 92") giving something to the geeky fans. It was a slick and professional performance, all smiles and bright graphics, but they are old enough and wise enough not to take it too seriously and clearly seemed to be enjoying themselves. With a nod to Siobhan leaving the band, she wanders off stage to the final chorus of "Cheers Then" ("cheers then, we're saying goodbye"), only for her to re-emerge a few minutes later to sing her dark chorus from Shakespeares Sisters excellent "Stay". This time instead of trying to entice some unconscious boyfriend from a coma, the song brings the band all back together (awwww). Sweet. The show picks up pace in the last four songs with "Venus", and "Na Na Na Hey Hey Kiss Him Goodbye" (a song with an ongoing life as a football chant) finishing off the main set and Fun Boy Three's "It Ain't What You Do" and their own "Love In The First Degree" ending things. It is what pop music is good at, having fun. Did I enjoy myself? Guilty.